I remember hearing their stories: friends returned from Peru exuberant; cheeks flushed with health from the pure air of the Andes, eyes flashing with enthusiasm for what they’d seen. They raved about people who spoke ancient languages and ate strains of produce that hadn’t yet been modified into homogenous, supermarket friendly tastelessness; ubiquitous, dewy eyed alpacas, and of course, a secret city hidden from time in the mists of a cloud forest at high altitude. But it turns out all of those marvels were seen after nights spent in…hostels. Or worse, tents. Sorry, that’s just not for me. I’m not ashamed to admit that when I travel, I love my hot baths, liveried doormen and indulgent amenities. I want to shop for stuff that is handmade, sure – but I also want it to look like it could have come from Harrods as opposed to some hippy market. The impression I had was that all of these were all sorely lacking in Peru. How wrong I was. Peru is actually the perfect destination for luxury lovers, as I was delighted to discover. 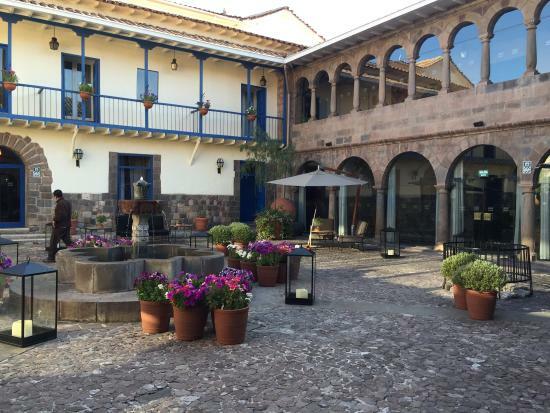 My adventure, if we can call it that, began at the Palacio del Inka, a five star hotel in the heart of Cusco’s historic district. 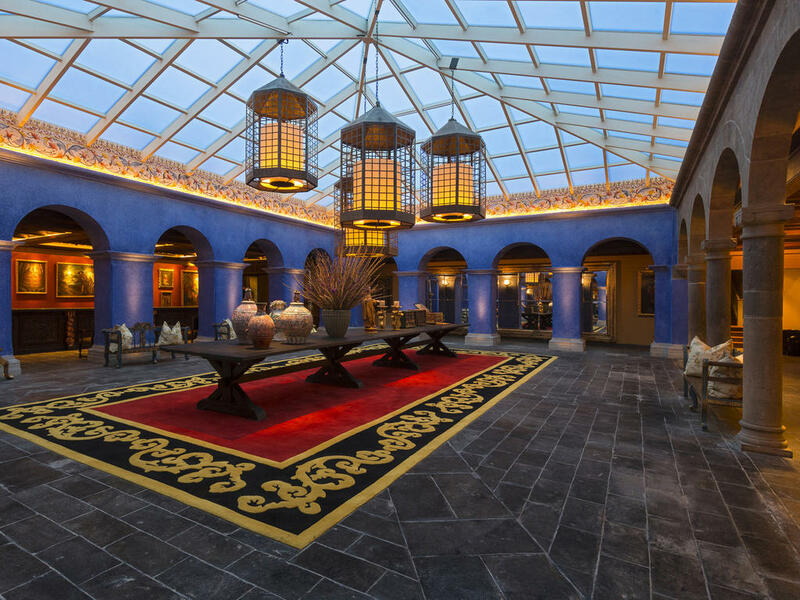 The hotel itself oozes history – it was once part of the Temple of the Sun.Constructed in 1438 by Inka Pachacuti, this Inca leader also build a number of impressive adjacent structures, which form the walls of the hotel still today. After the Spanish Conquest, it was taken over by the bloodthirsty Pizarro family. Many of their own, personal decorative objects and furnishings remain; it’s a rare thrill to be able to say you’ve slept in the actual bedroom of a Conquistador, but that’s exactly what I did. It still contained some of his tapestries and gilded bedposts, amongst other objects. To help me acclimatize to the high altitude, oxygen was filtered into my chamber. Exploring UNESCO World Heritage site Cusco reveals not only more rich history, but luxurious delights as well. There’s plenty of shiny jewellery here, fine enough to please any Spaniard searching for El Dorado. My favourite shop by far was Aldo & Co, where locally sourced silver and gold comprise designs mainly with an Incan vibe: think gilded pendants in the shape of the Incan cross; fierce, Incan mask brooches and tiny, delicate reproductions of Incan gods etched onto earrings. Sustainable luxury fashion is also abundant, thanks to the fine fibres of the local alpaca and vicuña. The former is reminiscent of cashmere, but doesn’t heat up as much in the sun, making it perfect for the fickle Andean weather. Vincuña, on the other hand, can only be described with metaphors involving angel’s breath or lover’s whispers: it’s softness and rarity justify its price tag (coats can go up to £50k in Europe, but prices are around half of that here). Unlike alpaca, vicuña cannot be ranched, and they are only brushed for their hair once a year. There’s a reason Peruvian food is exploding on the international culinary scene: cooks here are influenced by the Japanese and European immigrants, plus the local produce is so fresh, you can even sometimes see the huerta it came from. Think: enormous kernels of puffed mais, potatoes in dozens of colours cooked in dozens of ways, unpronounceable, juicy fruits from the Amazon and lake-caught trout finely sliced into tangy ceviche. Vegan restaurants abound, and there’s plenty of fine dining, too, such as the Inti Raymi restaurant at the Palacio del Inka . Here, I was treated to an amuse bouche of chopped vegetable salsa on a giant slice of fried sweet potato, followed by a rich Napoleon of vegetables, a creamy quinoa risotto, and an array of exotic desserts including carob ganache, prickly pear ice cream and a lemon tart topped with sky-high meringue. There was barely room left for an organic espresso, but I (happily) managed. The Urubamba Valley is fast becoming the home of choice for expats desirous of leaving the crowds of Mexico and Bali behind. Here, verdant valleys cut through by a raucous river recline in the warm embrace of scrub-covered mountains. 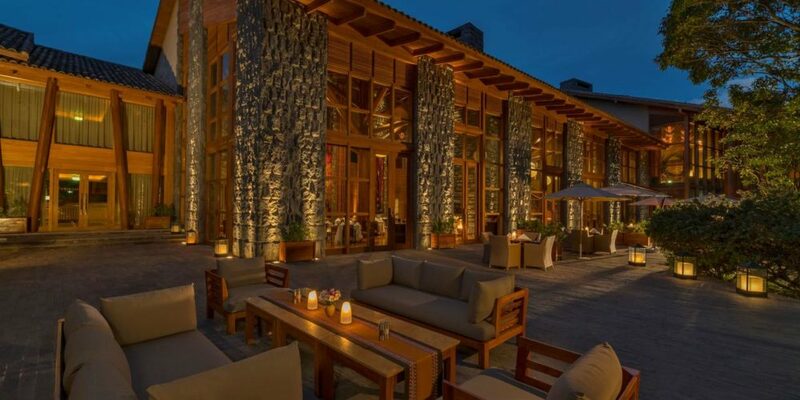 The LEEDS certified Tambo del Inka, a Luxury Collection Resort that lies on the banks of the Urubamba river. Here, the tree-covered grounds are abuzz with hummingbirds and fluttering butterflies, and the inside is just as beautiful. 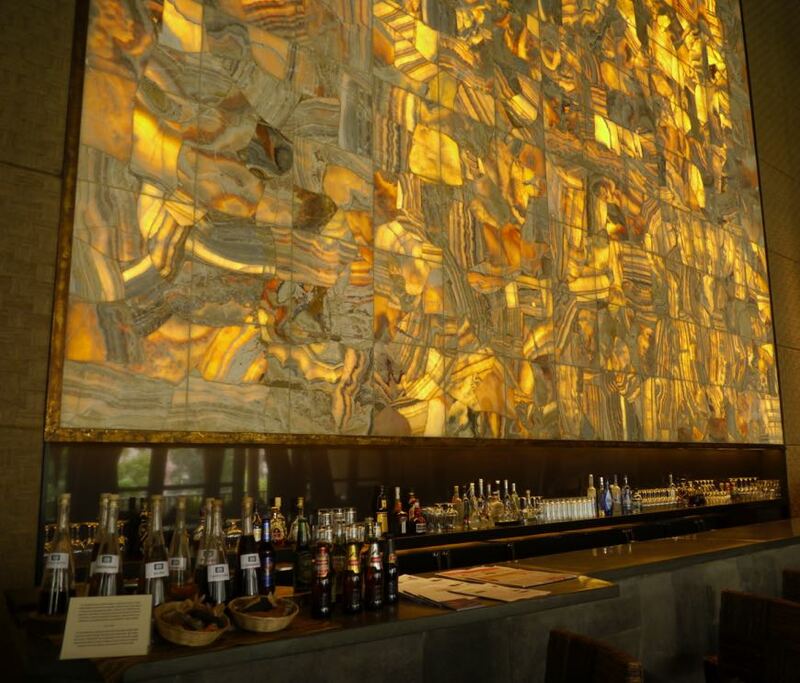 The Kiri bar features a 2.5 meter high backlit amber wall; the sky-high fireplace in the lobby is surrounded by local art, and the quiet, homey rooms are decked out in local kiswar wood. My favourite part of this marvellous hotel, though, is its spa. 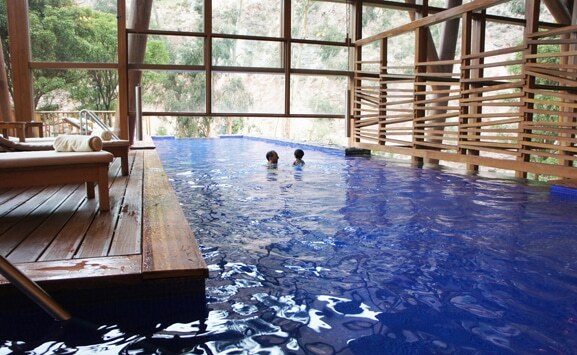 Featuring an indigo tiled, heated infinity pool that begins indoors and stretches out to the forest beyond, it’s the perfect place to unwind after a rigorous workout at the hotel’s gym or a run around their splendid outdoor track, which followers the perimeters of the Urubamba river. There’s also a water circuit available with hammam, Jacuzzi, thermal baths, sauna and of course, the usual range of spa treatments are on offer – as well as some specialized Andean ones, too. Perhaps the feature that most stands out at the Tambo, is its train station. That’s right: guests here need not make their way to the crowded, chaotic train station at Ollytantambo to board for Machu Picchu; if you stay at the Tambo del Inka, the train comes right to you at a specially designated hotel stop. That, my friends, is luxury.